Catalonia’s push for the November 9th referendum on independence comes after four years of organization. Unlike Scotland, all polls  show a comfortable majority of Catalans in favor of becoming Europe’s next independent state. The EU is at stake if Catalans have their way and say ‘Yes’ to independence, as it will probably set a precedent for other nations (e.g., Flanders, Basque Country, and obviously Scotland). The EU is increasingly perceived as caring nothing for the identity of its member nation states or peoples. Indeed it is a fact that the EU seeks to homogenize and dispossess the European peoples through mass immigration (i.e., cheap labor) in favor of a single and “efficient” market. As for Spain, it can be argued that we are witnessing the last dissolution phase of the remains of the old Spanish Empire. The Spanish Crown lost Portugal in 1640, then the South American colonies. Now, the old nations in the Iberian Peninsula, among which is Catalonia, are following the natural path set by many other nations around the World and attaining self-rule — or as limited a sovereignty as a State can have in the World today. Some basic facts have to be highlighted in order to understand the present-day situation. If we speak of Catalonia today, we have to bear in mind that we are talking about an Old Nation with its roots thousands of years deep, in the preceding tribes and peoples that have inhabited this land before present-day Catalans: Iberians, Celts, Greeks, Germanic tribes, etc. Nevertheless, we can argue that most of the present national character of the Catalans derives from its Carolingian (and thus Gallic) origin. Indeed, Catalonia was part of the Carolingian Empire, before our first King broke ties with it almost 1,100 years ago. The Catalan dynasty then was born. It is said that the Catalan language and national character reflect that origin. Much later, an important year to remember is 1640. As noted above, in that year Portugal ceased to be part of the Spanish Crown, precisely because of the cost to the Portuguese people of the war that the Spanish Crown was waged against the Catalan rebels. These events were followed by the 1707-1715 war, which ended with the definitive Occupation of Catalonia, right after the 1659 “Treaty of the Pyrenees.” By means of the Treaty of the Pyrenees the French and Spanish crowns divided Catalonia in two. Despite that terrible defeat, the Catalan spirit lived. It can be argued that our will for national freedom was one of the reasons behind the 1936-1939 war, after which Franco came to power. Of course there were many other motivations behind that war, but certainly we can argue that the Catalan case was an important component of it. Ultimately, present day events can only be understood if we take into consideration this long history of struggle for national liberation — to regain lost sovereignty. A Spanish nationalist might say that only the “weakness” of the present-day politicians, and perhaps “progressive” influences can explain their country’s decadence. I cannot debate such a point in this short article, but it cannot be denied that Spain is not only in the midst of both a political and economic crisis, but also under a territorial crisis. And it is an important one. The Spanish State as we know today is likely to change its territorial frame in the coming months and years. Just as it has been continuously doing in the last centuries. Unlike Scotland’s referendum (where the British and Scottish governments agreed upon its terms), Catalonia’s has neither been approved nor allowed by the Spanish Government. The Catalan Government will carry on with it even though it has been forbidden by the Spanish High Court, and it will be carried out by a huge network of volunteers, plus International observers. The fact is that, despite the lack of official approval, a very astute tactic is apparently going to allow us to vote: there will be no census that can be hijacked by the Spanish authorities. Instead, people will subscribe to the census as they vote, showing their Identity Card right before voting. We’ll see if the Spanish Government will send the Police to each and every polling station, showing the World its true nature: that of an occupying force. Also, it is important to bear in mind that the referendum has the support of 107 out of 135 MPs in the Catalan Parliament, and 96% of the Catalan municipalities. Democracy? What Kind of Democracy? From an European New Right or Identitarian point of view, it can be argued that the sole negative aspect of this referendum will be that it is predicated on a universalist conception of democracy. Indeed, foreigners of non-European origin will be allowed to vote. Yes, it could hardly be any other way, and universalist democracy will once again dictate the terms of an election on European soil. In other words, nothing new here at all. At this point, we must ask ourselves: What type of democracy (if any) do we need? Catalans (and for that matter Bretons, Irish, and any other European people) need to understand that as much as this referendum is necessary for national survival in the short term, in the long run we need to be conscious that universalist democracy can mean our national dissolution as well. In a world of open borders and multiculturalism, universalist democracy means national death for any European People. 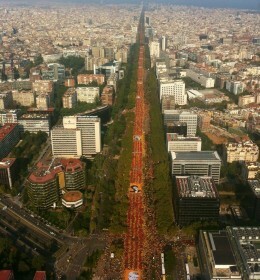 Without the Catalan People there can no longer be any Catalonia. Without Norwegians, there is no Norway. If we are all just “human beings,” then it doesn’t make any difference if the Catalans or Chinese call Catalonia home. In the end, it is vital that we challenge the Leftist claim that says that if you live and work in a given part of the world, you are as much a part of it as anyone else. This Marxist conception makes labor the sole element in peoples’ lives and says that we can ultimately reduce a nation simply to a “group of workers” — and passers-by. So, yes, despite our proud history, we Catalans are infected by the same intellectual viruses as any other European people. Despite the fact that this is not a referendum any supporter of the European New Right would wholeheartedly endorse, it should have our support. We should support every Nation’s right to independence and, obviously, to self-determination. We may be witnessing in Europe a revival of ethnic nationalism. This could mean a chance for a better and stronger Europe, a possible path for European Reconquista. On the other hand, we might be witnessing the last years of existence of the Spanish Crown (as we know it today). The French and Spanish ruling classes can no longer hold under their dominion the peoples of “their” territories. Besides a terrible economic crisis and rampant corruption, a territorial challenge poses serious problems to them. Published: November 8, 2014 | This entry was posted in North American New Right and tagged articles, Catalan Independence, Catalonia, North American New Right, originals, Otger Batlle, Spain. Both comments and trackbacks are currently closed. After living in Spain (and Catalunya) for a number of years, I’ve found this sort of posturing to be unhealthy. The claim that Andalusians are the epitome of Spanish identity usually is made by Catalans because Andalusia is the poorest region (against whom charges of Arabism are often levied). Associating it with Spain on the whole is meant as a put-down, but lacks any grounding in the realities of Spanish society. If anything Andalusia is more distinct from other Spanish regions than they are from each other. Catalunya is distinct, being Mediterranean, from Basques or Castilians, Galicians or Asturians, but much of the history ascribed to it by nationalists belongs to the Kingdom of Aragon as a whole, anachronisms notwithstanding. One should be upfront about that. Yes, unfortunately Catalan separatism today is associated with pro-immigrant sentiments and with the left in general (like the author implies). The benefit of an independent Catalonia actually outweighs these costs as counterintuitive as it is to see this. Ultimately, as a race, Europeans are NOTHING without their individual historically rooted identities whether they are Basque, Occitan, Catalan, Tuscan, Ligurian, Bosniak, Etc. These nations have/had, more or less, a unique language, cuisine, political history and yes DNA. Unfortunately, over the past two centuries(but NOT under old monarchies like Holy Roman Empire, austria hungary) of arbitrary nation state building, be they the case of Italy or France or Germany or what-have-you, today, these identities have all but eroded. These are nothing but proposition nations much like Uncle Sam! What does it mean to be italian or french anyways if any sub-saharan immigrant with a substandard knowledge of French can declare himself Frenchman as readily as a man from Dijon whose ancestors have lived in the region for over 2000 years? And let’s not forget that the Catalans have a rich history. Along with north/central “italians”(ligurians, tuscans), they had a powerful commercial empire in the mediterranean and a rich tradition of scholarship as well. These were the DOMINANT players in the region. Like basques, they were indispensable keystones of the spanish crown. Many contend that columbus was catalan(as opposed to ligurian). (which go hand in hand, in many cases since Andalusians/Mozarabs can be thought of as uber Spaniards, the distilation of what it means to be a Spaniard). So many Catalans today are of mixed/non catalan heritage. Which is this: lets recognize the autonomy of these people first and THEN take care of the rest. Catalonia is not Spain. Catalonia—IF ANYTHING—-is Occitania. As for falsifying history, a clear example is found in how the “Diada” (11th of Sept) has been appropriated by separatists, despite the fact that this 1714 rebellion against Bourbon absolutism began with a declaration by the mayor of Barcelona in favor of “the freedom of this principality and of all Spain; to avoid the slavery that awaits Catalans and the rest of Spaniards…”. It is also the case that the expression “Països Catalans” is used in Catalan schools to at least imply that Valencia, Aragon and the Balearic Islands are Catalan (the denizens of these regions are quick to dissuade one of this view). Thusly is animosity towards related peoples promoted, as well as the groundwork created for the sort of annexation project Europe hasn’t seen in a while. More generally, why can’t a national identity articulate itself while sharing political institutions with related nations? Alain de Benoist’s essay on Johannes Althusius is edifying in this regard. This article is a shame. It’s so full of lies that I don’t know from where I can start with. Now, pro-secessionists -who, by the way, there are all reds and liberals- celebrate this calling and this historical character as if he had been a separatist, at the “Diada” day, on 11th September, saying that he was a Catalan Patriot against Spain, etc…which is absolutely false and ridiculous. This cultural and historical manipulation began long time ago because the Bourgeois Catalan Class wanted more economic privileges. Since 1978 and with the current Constitution, every Community -province administration- in Spain has its own educational system…so guess, what happened? The same as Cultural Marxism in Western World: Political, Cultural and Historical indoctrination and manipulation. The outcome is this fraternal and non-sense quarrels. I was on 12th of October, the Spanish National Day, in Barcelona and I was with true Catalan and Spanish patriots, the only ones who publicly are against massive non-European immigration in Cataluña: members of Plataforma per Catalunya and Casal Tramuntana and They have the same view as mine. Don’t let yourselves be deceived by this propaganda, foreign readers. I’m also very disappointing as another usual reader of CC. Your material is often very good, but in this particular case, you are absolutely misled. (TO THE EDITORS OF THIS BLOG): I am no avid spammer, I assure you. I am a fervent supporter of our common cause and I, somewhat of an authority on the Catalan/Occitan subject, am here to dispell destructive propaganda levied on these brothers of ours by some bitter Spaniards—no offense to Spaniards in general here). @Spaniard, feel free to read my other two posts on this article. They are addressed to you. In a nutshell, I think you should come to terms to the fact that Catalans and Basques are both traditionally distinct ethnic groups from Spaniards. Their language, customs, and mentality are more in line with those of Occitania. Your desire to erase their identity does not help the European cause in any way. In fact, by lumping people into ever increasing “nations”, you are actually aiding and abetting the globalists who want to take things one step further every day. One thing I liked about the Austro Hungarian realm is that it was more like a confederacy of recognized nations. The was no ‘austro hungarian’ identity construct there. Croats were Croats. Germans were Germans. Hungarians were Hungarians. They simply fought under one flag against Turks, Russsian, and other powers but always retained their traditional ethnic identities. Nobody tried to melt them together like Spanish authorities have for centuries. Anyways, Catalonha is not Spain. You don’t say anything. You just say time and again: “we are very special”, ” I am an authority” (ok, cyberwarrior…oh, sorry, Catalan Cyberwarrior. We believe in your word. As you have to believe in mine when I say that I have a degree in History). You are not a fervent supporter of anything because if you were a normal person and not a brainwashed one, you would be fighting with the organizations who are against mass immigration firstly, no matter if they are pro-Spanish or secessionists, instead losing the time with this ridiculous non-sense. “Your desire to erase their identity does not help the European cause in any way.” Strawman falacy, reread my comment. For foreign readers: this is the way they manipulate. hahahahahaha, you compare Hungarians and Germans with different Spaniards. The more I read, the more I laugh. Did you know what happened with Austro-Hungarian Empire? It was disintegrated and its different nations haven’t had any power so far again. By the way, Why didn’t you put the example of France (Brittany, Occitant Area, Basque Area, etc…) or Italy? You are not intereste, aren’t you?. We should have done like France (total uniformization and centralization) instead of letting Catalan bourgeoisie manipulate and blackmail central Government. “Anyways, Catalonha is not Spain” Yes, this is your main point. Crying and childish statements. Italian, French or Germans readers see what Catalan secessionists desire and think about your countries. It’s ridiculous that in an Age of Globalization, when only Great Territorial Powers can struggle for independence, we are talking about territories conceived in Middle Ages. Moreover, having a large territory/nation or a Federation is not at odds with respecting minuscule identities. You are an ignorant or a liar. The Dominant power in the Mediterranean Area (XIV and XV centuries) was the Aragon Crown: http://en.wikipedia.org/wiki/Crown_of_Aragon which main population and sources were not Catalan, were Aragonese and which name is not “Catalan Crown” but “Aragon Crown”. By the way, we can find lot of testimonies even during so early age of the common nationhood among Spaniards. For example in the writtings of the important Catalan Poet, Ramón Muntaner, when he says that people of León, Castilla, Catalan are a same blood and flesh. Basques were basic for the Spanish Crown because they were extremely loyal and brave. but Catalans….hahaha. Catalan’s people didn’t give a coin to the Spanish Empire and almost didn’t send a soldier. When they were demanded to help, at least a bit with “Nueva Planta Decrees” http://en.wikipedia.org/wiki/Nueva_Planta_decrees, they started to make up history (as any reader can see till now) and blackmail the Central Government with threats of independence. Meanwhile, they had been enjoying economic protectionist and Spanish markets for their products (a situation which could not have been possible if the Spanish Government would have permitted foreign products as the British ones). That’s why they are in certain way rich in this region: because we, all Spaniards, protected the area against foreigners and bought Spanish-Catalan products. Franco, by the way, also helped in this process. Now, this spoiled secessionists hated him, you know…he was “too much Spanish”. For non-Spanish or Catalan speakers: first, he says that Catalan’s people are “Middle Easters” /traders and people from Castile are Imperialists and Warriors (this is the Catalan image of the promoters of independence so imagine his position against non-Europeans), Catalan Nation was borned in the VII century but Cataluña was alived since 2700 years ago (??? ), Tartessos was the original Cataluña’s Capital, Cataluña was the most important country over the World from the XIV century to the middle of XVI century, United Nations has its precedent in the XI century in Cataluña…etc. This is the type of “history” they learn. All lies again. I hate Andalusians stuff ( I have never been in a Flamenco performance in my whole life or I don’t like Bull fightings), and I’m a Spaniard nationalists, so your logic is wrong. By the way, in the article says that 1635/1640 rebellion was a cry for independence, blablabla…what you never say, it’s that in the same year, there was another rebellion in Andalusia because they wanted to get independent from Spain like Cataluña. This stereotypical image of Spaniards is absolutely fake. It was made up by French Romanticists in the XIX century and it has nothing to do with reality (with exception of the South of Spain). As everybody can see, Catalan secessionists have a surrealist view of history, culture and the present situation in its own territory. 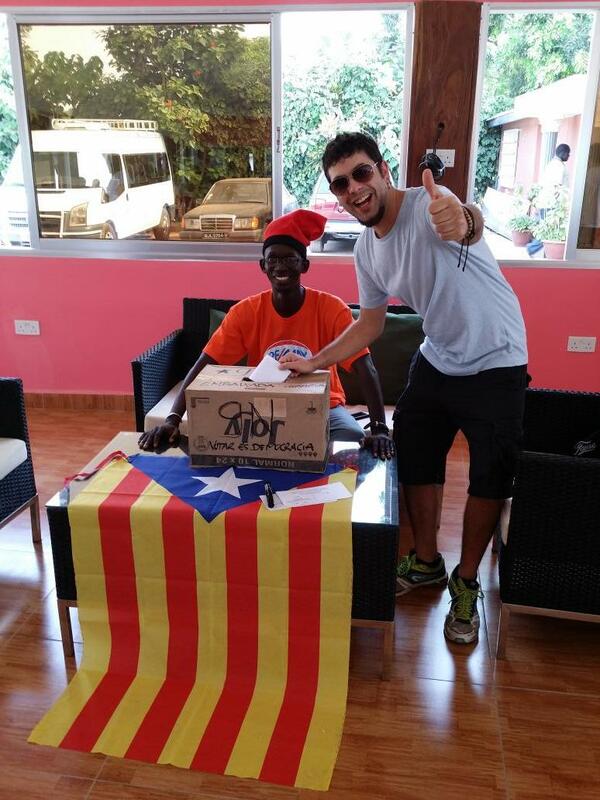 As I said before, massive brainwashing happened in Catalan Region. P.S: the second part of the article is, again, full of lies. For example, the author didn’t say that only 35% of the possible voters went to support independence (mainly, people who vote parties pro-immigration) or there were people who took pictures voting 3 times in different places, etc…everything is ridiculous, malicious and a farce with this people. I question who is behind the move for this “independence”. Who benefits? I hope the Catalan people don’t buy into this bull**it. Good essay. The part on the Spanish Civil War is interesting. Curiously, and amusingly, the author glosses over the war and obfuscates the role of Catalans in that conflict. Why? Because Catalonia was overwhelmingly anarchist, socialist, communist, and republican and played a key role in the Red Terror that slaughtered Catholics and Catholic clergy. The Judeo-Communist International Brigades were based in Catalonia, and the province was a major hub for Soviet aid to the republican regime. The anarcho-feminist women’s movement ‘Mujeres Libres’ was also based in Catalonia. Indeed, it could be said that anarchism is at the center of the Catalan spirit, which is one reason Franco rightfully suppressed the region after the war, and why there is still so much anger and bitterness among Catalans. I hope that you are somehow not implying that the presence of communists/jews in any region implies that the ethnic group in that region is automatically, well, a fifth column when it comes to our race. Look, the left has been very active in Central and Northern Italy as well. As in southern France. Does that imply that Occitans/Ligurians are working in cahouts with our enemies? In fact, the “anarchist” Catalan, Ligurian, Occitan, Tuscan, etc. spirit is one that is more disposed to free thinking than to brainwashable Mozarabs in Madrid and Sevilla. Or for that matter the northern Europeans in Europe or abroad in the US(WASPS) who have enable the Hostile Elite to essentially hijack their lands. In Occitania, the RELEVANT parts of Italy and Catalonia, there has historically been a Jewish presence but not an overpowering, controlling one like in Eastern Europe or in lands of WASP origin in recent times(or in Spain for that matter). Viva Occitania and Catalonha. Spaniards and their propaganda—-vergonha! It’s easy to deceive non-Spanish people who know nothing or very little about Spain’s History. This nonsense is just the result of decades of indoctrination and lies pushed by the Catalan government and its allies. I’m a usual reader of Counter-currents, and I’m very disappointed by this article. I don’t know your intentions but I was lucky enough to learn In Catalonia during my University years, their language and traditions which in respect to their history is all very realistic + forward thinking as well as unfortunate, because other powers near them have always suppress their future, by saying that I hope the Catalonians do get to the end of it. Isn’t Catalan nationalism associated with the hard left due to the Spanish Civil War? This seems similar to the Scotland case; I have no problem with Catalan or Scottish independence per se, but I would oppose it if it means putting leftist governments in power to accelerate the replace of white European populations. Would dismembering the classical states of western Europe really be in the interest of a European Reconquista? Maybe more federalism is a better option to full independence (which under the EU is just a farce anyway). In my opinion, Federalism is about sharing power among equals. I am for that. I am for a Europe of the Peoples. But why is that the only time I hear about ‘federalism’ (‘autonomy’ maybe is what really some people are thinking about?) is when ‘small’ nations struggle for their survival? I am for pan-European nationalism, which for me means that we all have to leave a bit aside our ‘petty’ nationalism, and to focus our forces on what is threatening to wipe us all from the face of the Earth (‘Le Grand Replacement’). Again, can’t we work together without a common enemy? We badly need to come up with a new project, where Catalans, Flemish or Bretons are not treated as second class Europeans. As for “Isn’t Catalan nationalism associated with the hard left?”, one of my hypothesis is that Scottish and Catalan nationalism are ‘left’ (??) leaned because ‘the right’ (??) has offered them only their (sometimes soft) extermination. I am both against multiculturalism and imperialism. Both are evil. I think the survival of European peoples is over ‘Left or Right’. As a concept, if we don’t want certain groups to survive, our project is doomed to fail. There are supporters of secession on both sides of the usual political spectrum. Catalan separatist drive is not a left-wing nor a right-wing issue. Its supporters are still a minority among the Catalan general population, though a noisy, very influencial, powerful, well funded and growing minority. The regional political power (the government as well as the parliament) is clearly more skewed towards nationalistic stances than the general population, and this is common knowledge. I think this is due to a couple of factors: the political ‘consensus’ (just like the ‘liberal-progressive consensus’ in the Western World) and the abstention rate, which keeps many of the non-nationalist voters away from the political game, by their own will -or lack of will. Anyway, it doesn’t fit in the kind of nationalism that C-C advocates for. Its plain treachery. If the political stablishment of Catalonia find it useful, they’re likely to make a deal with the muslim community (about half a million): the muslims would give their political support to the separatist plan, and the government would give them, let’s say, the former bullring ‘La Monumental’ to build a giant mosque, citizenship, entitlements… whatever. I guess they’re likely to do something similar with the black African community. The new Catalan people could look like this in the future. Had Catalonia been a region of France from the beginning, there would be no separatist movements there. They’d be good and loyal French citizens, they’d speak French day and night, and they’d vote for Marine Le Pen. As a final thing, I’d say that this is not part of the Reconquista. If something, it reminds me somewhat of the internal strife in the Spanish Visigothic Kingdom -Roderic vs. Achilla- just before the Muslim invasion. Treason was the catalyst of the following epic disaster. * The population of Catalonia is not 10 million. It’s about 7.5 million, actually. I had a dispute with a catalonian regarding the need for their independence. He was all for it, and I could understand his point of view. But when I suggested that they, to really prove their independence, withdrew Barcelona FC from the Spanish super league, and incorporated the club in a catalonian only series, he would have none of it.